Wolf cub. Click for LARGE. Cute wolf cub. Shockingly cute. So cute I might pass out just from sighing at how cute it is. Cute cute cute cute cute. Greenpeace, the National Audubon Society, the Sierra Club, and other green lovers use photos just like this one to guilt good liberals just like you into giving them money ALL THE TIME. 'Cause when you see photos like this, these associations always hit you with, "Give right now or these critically totally CUTE endangered baby animals might DIE. Maybe even their entire SPECIES or HABITAT will DIE." 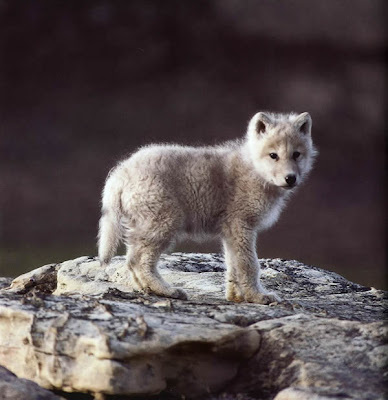 Group News Blog is proud to bring you this cute baby wolf cub with absolutely no guilt attached. Born and bred in captivity, we promise this oh so cute baby wolf* and its buddy wolves -- lots and lots of buddy wolves -- will live a long, comfortable life no matter what you do. The cub's only job? To wolf around in an enormous natural outdoor enclosure, eat healthy meals, be cared for by a wild-animal vet, and produce more wolves. In exchange for this moment of guilt-free cuteness, we ask you to give generously. The wolf would want you to.